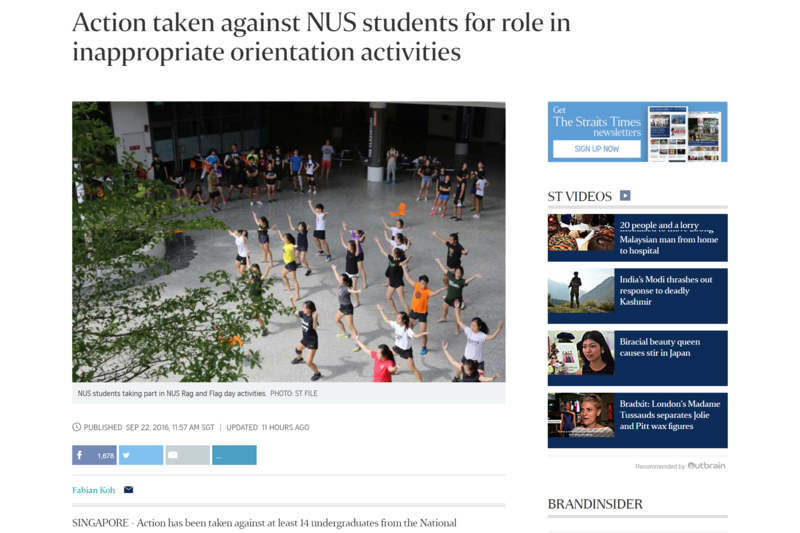 So The Strait Times ran a report yesterday about how students involved in the planning of the much debated orientation games, have been given punishments by their school, the National University of Singapore. Any news regarding the disciplinary proceedings so far has been a hot topic amongst Singaporeans, especially NUS students and alumni, and many are interested to know the outcome. Chances are you have already seen the article, and read its contents. The article itself has been shared 1,678 times as of this morning. And was reacted and shared by hundreds more on their Facebook page. Understandably, this is a sensitive issue concerning the futures of the current batch of students involved. But no, the reporter continued the story by citing several ‘sources’. 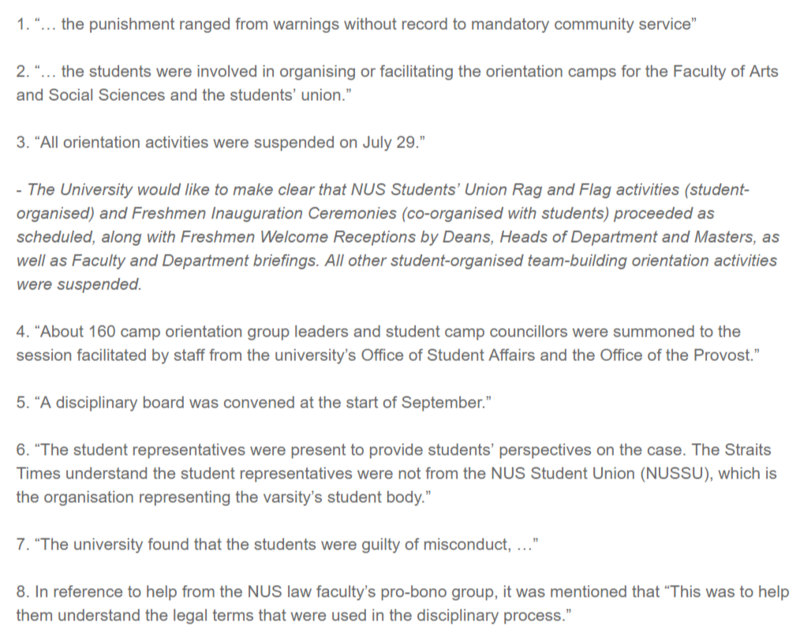 Who these ‘sources’ are, we will never know, but one thing is for sure; the disciplinary committee involved is not one of them, as within the same day NUS released a statement. 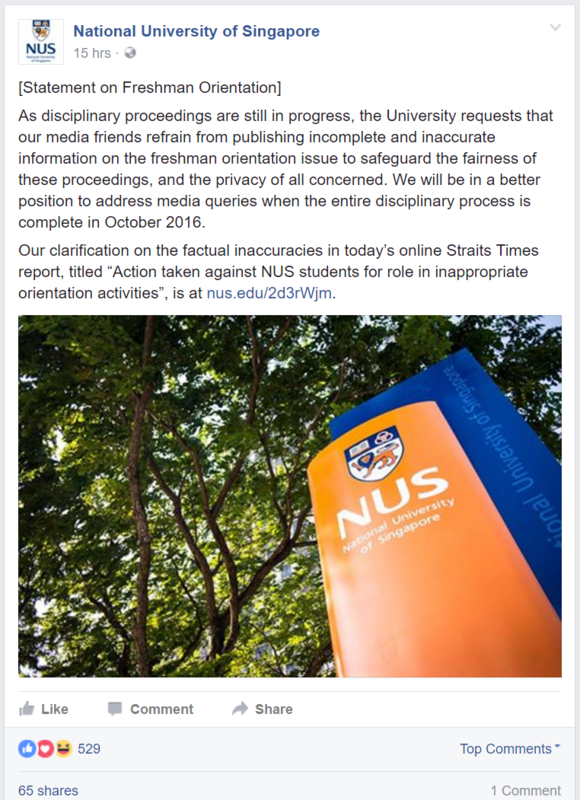 So to protect its dignity and the privacy of any involved students, NUS posted a social media update on the matter, and attached a link to their official statement to highlight and correct the ‘factual inaccuracies’ that The Straits Times has published in its report. 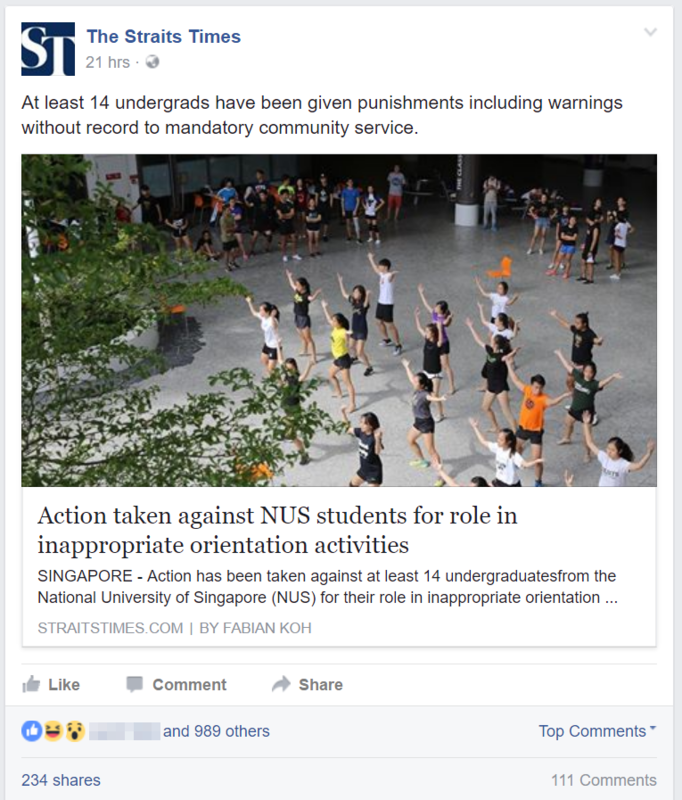 NUS already informed The Straits Times that the info which they obtained is incomplete and inaccurate. Get this, NUS both wrote and made a phone call to the newspaper stating that they should refrain from publishing whatever information they currently have, and make another enquiry to the school once the disciplinary process conclude next month. Right off the bat, NUS is came out strongly, to denounce The Straits Times actions, making it very clear to them beforehand to respect the school and its students. NUS proceeded to list down each and every discrepancies in the article, and went on to explain the importance of the freshmen orientation program, but more than that, it should be carried out in a respectful manner. As to the matter of the students involved in the disciplinary hearings, they have been informed of the proceeding’s results by Board of Discipline of the school, and they are open to submit an appeal to the Disciplinary Appeals Board, after which any decisions meted out thereafter is final. Don’t worry, these students have also received legal advice too from the NUS Faculty of Law’s Pro Bono Group. As a result of the allegations, NUS decided to set up an Orientation Review Committee (ORC) to review and make recommendations for all future orientation programs to prevent any future uproar, and is expected to file a report on it on the same month as when the disciplinary proceedings conclude. The university ended off their official statement by calling out all media outlets to refrain from publishing any written matters on matters of the orientation and the disciplinary processes of the students until they conclude in October 2016, and also to exercise ‘accurate and responsible‘ reporting. So please media friends, save yourself any embarrassments and not emulate The Straits Times. Read NUS’ full statement here.